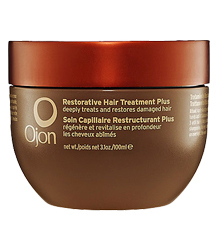 Ojon Restorative Hair Treatment Reviews | Does Ojon Work? Unlike other features of our bodies, hair is incredibly versatile and open to quick change. It can be altered so much from its original form that it is more like an accessory than a body part. However, it's important to remember that altering the texture and color of our hair can also come with consequences that are less than lustrous. Chemicals that seek to uncoil curls or maintain the starkly platinum hue of a natural brunette will come with a price. The further you go from your hair's natural state, the more damage it will inevitably sustain. If you've had your hair recently colored, permed or relaxed, it's especially important to hold off on using heating tools that will only cause the hair to dry and become more weakened. Our hair is crafted from precious protein chains that are highly susceptible to acute levels of heat and topical treatments that involve chemicals. Repairing destroyed hair from the outside just isn't really possible. Does Ojon Restorative Hair Treatment Work to Treat Damaged Hair? While we can achieve the appearance of healthier hair, most treatment solutions don't have the ability to permeate the hair shaft and make much of a lasting difference. Even the best products can't perform miracles, but Ojon Restorative Hair Treatment claims that it can reconstructure hair in as little as one treatment. In fact, it boasts a 64% increase in the hair's condition after your first use. However, trials have proven that this product isn't quite capable of delivering such lofty promises for everyone. Ojon's most coveted ingredient is an oil derived from the Ojon nut, which grows on palm trees in Central and South America. While the product boasts of its restorative qualities, when tested on a variety of hair types, the results are mixed. Some customers report that it indeed gives the hair a supple feeling, but once it is no longer used, the hair quickly reverts back to a dry, weakened state. If you intend to continue using heating tools in conjunction with the product, you won't experience any improvement in your hair, and it will likely deteriorate even more. Some customers have even reported that the Ojon treatment left their hair feeling more course and brittle with continued use, especially after washing it out. It's possible that for some hair types, the product serves to strip hair of its natural oils. If you have particularly thin hair, this product may also feel quite heavy, and prove to be difficult to remove. Before using a regular treatment, it's important to always test a small area, especially if you are concerned you may be allergic to the Ojon extracts. Overall, Ojon proves ineffective, and customers have even complained that it has an unpleasant odor akin to tobacco products. You can purchase the Ojon treatment online from a variety of retailers, including Amazon and Ulta Beauty. If you are on the fence about this product and would like to learn more about alternative treatment options for dry and damaged hair, click here for a comprehensive view of some of the highest rated products on the market.